Isn’t it all about the take? As regular readers of this column will know I occasionally pen a few ramblings for our cousins Down Under at Australian Fishing World following my post parliamentary sabbatical out there a few years back. The Fisho website is updated twice a week and this great little video clip of an enthusiastic barramundi following a lure and smashing it under the rod tip reminded me of some of the debates I’ve had recently with angling friends over what exactly it is that gives us the greatest buzz in our fishing. What feeds this fishing obsession? Is it reel screaming runs or leaping fishing – Martin’s first tarpon did plenty of both – or is it simply the thrill of the take? Whilst the lure of fishing for many is about the wonderful places it takes us and the friends we make along the way there has to be that extra ingredient that gets the heart pumping and keeps us coming back for more. Perhaps, for the dyed in the wool specimen hunter or match angler, it really is all about the size or quantity of the fish caught? For the purist, perhaps it is how they catch their quarry – whether this means a wild trout on an upstream dry fly in surface film or a chalk stream roach on a stick float and centre pin? I think it was Bernard Venables that once wrote that there are three phases in the development of an angler. First we want to catch the most fish, then we want to catch the biggest we can and then, in our later years, we reach that ‘state of grace’ where it is no longer solely about numbers and far more about where and who we fish with and how we catch them. Whilst I still get a thrill out of notching up a new personal best for a species I’m now very much in this latter category. I’m lucky to live within a 20 minute drive of some of the best swims for specimen chub, barbel and tench in the South of England yet increasingly I find myself favouring venues that allow me catch in a preferred style or location rather than those where bigger fish can eventually be ‘bored into submission’. It’s not that I no longer enjoy catching quality fish, far from it, it’s just that I get that extra thrill from hooking barbel on a float, stalking chub on a small stream or catching tench from more intimate waters where I can see them fizzing and bubbling and the excitement builds as I wait for the float to lift and slide away or the bobbin to rise. But irrespective of the place fished or the angling style employed there is another ingredient that keeps us coming back for more. I now argue that it is all about the take. Think back to those personal angling highlights indelibly etched in your memory and how many of them feature a rod top crashing round, a huge pair of lips engulfing a surface bait as time stands still or a float disappearing at the end of a trot and the answering strike being met by that satisfying thump of a good fish as it battles for freedom? I guess we can all shut our eyes and replay these magic moments again and again. I used to contend that most adrenaline filled experience in fishing was a screaming reel and a hard battle with a quality fish. 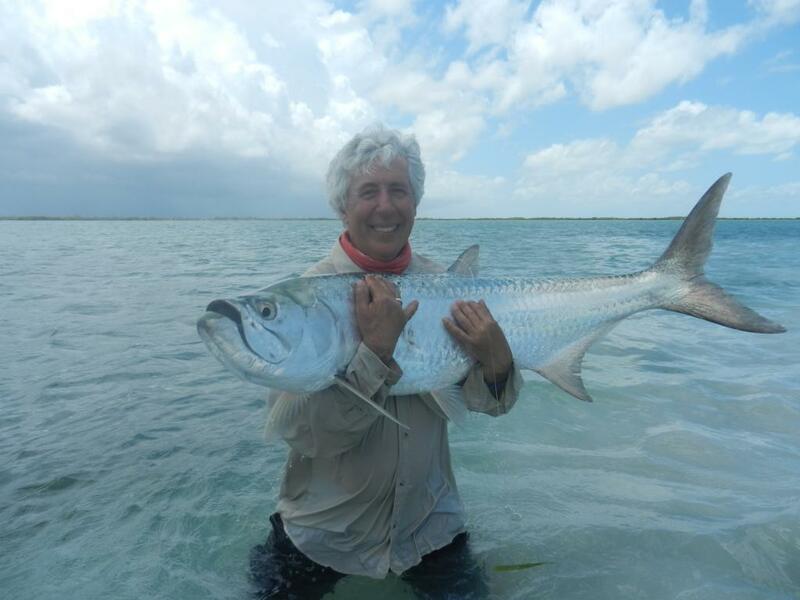 And having just returned from Cuba with my first tarpon under my belt, a fish that took over a hundred yards of line on its first run, I’m certainly not decrying the thrill of the battle. It’s just that what is it we all want to do once our fish is landed – surely it’s to cast out again to see if we can get another take? The fascination of fishing is fooling a wild, and sometimes wily creature, into taking our carefully presented lure, fly or bait. It maybe the thrill of the chase that keeps us coming back for more but I contend that it’s that moment of contact with the quarry, when the plan and the technique come together, that delivers the essential buzz that fuels the obsession that is fishing. My first barbel came from the Thames at Windsor in the 1960s and whilst I can still picture those three pounds of bristling muscle lying in the schoolboy landing net the image I’m left with is the violence of my first barbel bite which came close to catapulting that old bamboo and solid glass fibre rod halfway to London. 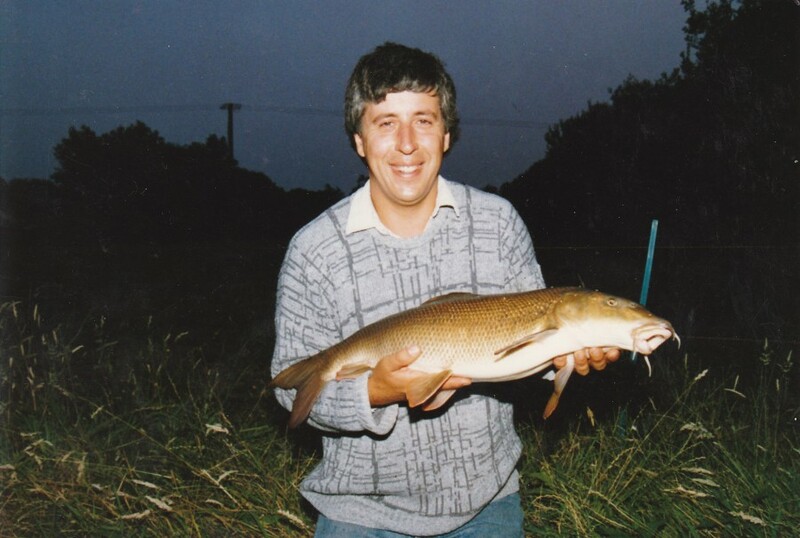 Even now, half a century and several thousands of barbel later, that ‘three foot twitch’ never fails to excite. At the other end of the spectrum the bream, a species hardly renowned for its fighting qualities, still holds a fascination for me. To a great extent this is due to the leisurely and sometimes finicky bites they give which only prolong the pleasure before contact occurs. Much of my fishing in Australia and New Zealand was with surface or shallow diving lures and there is no doubt that this style delivers some thrilling takes. I’ve had barramundi come clean out of the water and headbutt the mangroves in their determination to be first to the feed. Watching a pack of angry yellow-tailed kingfish chasing a popper towards the boat is one heart stopping thrill of which I will never tire. 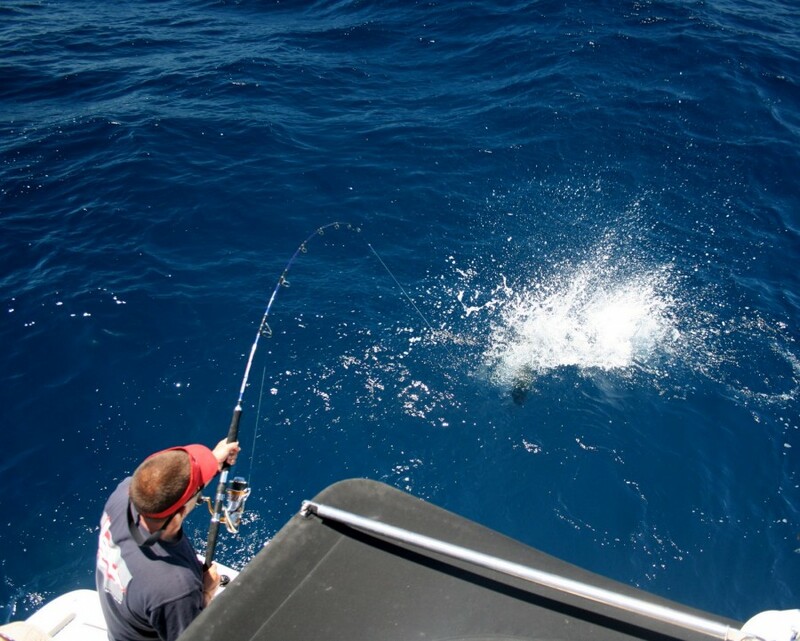 And of course seeing a marlin or sailfish light up in attack mode as they swing in behind the teasers before seizing the lure and greyhounding over the ocean is one of the greatest angling experiences of all. And there are fish that take a bait or a lure with an aggression that is simply frightening. I’ve been lucky enough to tangle with one two Giant Trevallys, or GTs as they are more commonly called, and the sheer violence of these creatures can be breathtaking. On one trip with Aardvark McLeod to the Indian Ocean atoll of St Francois we were privileged to witness what the guides call the Cappell Shoal, named after the guy who first spotted this extraordinary aggregation of GTs that patrolled the reefs like a menacing band of desperadoes. 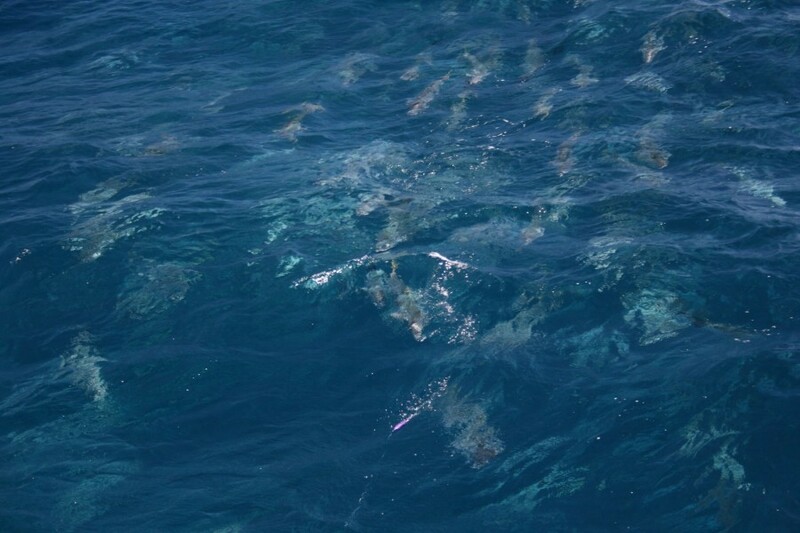 They came past in pairs in a long line just a few metres from us, flanked at times by much smaller reef sharks, and in a manner that reminded me of those huge military processions in Red Square during the Communist era. Our guide Devan was up to his waist in water holding the front of the boat steady and giving instructions to my fishing partner ‘Crunchie’ on where to cast his fly when a particularly angry brute of a fish broke from the formation. Incredibly it charged at his legs with malicious intent causing this normally tough and calm a South African to yelp in surprise and to leap back into the boat in the nick of time. It was at that moment I realised why GTs are so famous for the aggression with which they hit a lure and why they are called ‘Gangsters of the Flats’. Check out this great video of the same name for more heart stopping GT action .. Although I never saw it happen I’ve seen enough of GT behaviour to believe the following story to be true. Perhaps this could even win an award for the greatest take of all time? According to those who were there an American angler was on a surf walk, again in the Indian Ocean, and spotted a group of GTs close in. He cast, stripped back quickly and his fly was charged by the shoal and he hooked up briefly on one of the smaller fish in the group. However, the hook came free and the fly shot back towards him and embedded in the legs of his shorts just above the water line. None of this deterred the rampaging fish who simply charged the bewildered angler, knocking him off his feet and grabbing the flapping fly from his clothing before ripping it free and belting back out into the surf! The story has a happy ending as the fish was eventually landed and the angler’s honour restored. If there is ever a more enthusiastic take I’d like to be there to see it and although I have no doubt that, like all GTs, this fish would have given the angler a great battle, the enduring memory would not have been of the fight but of the bite. 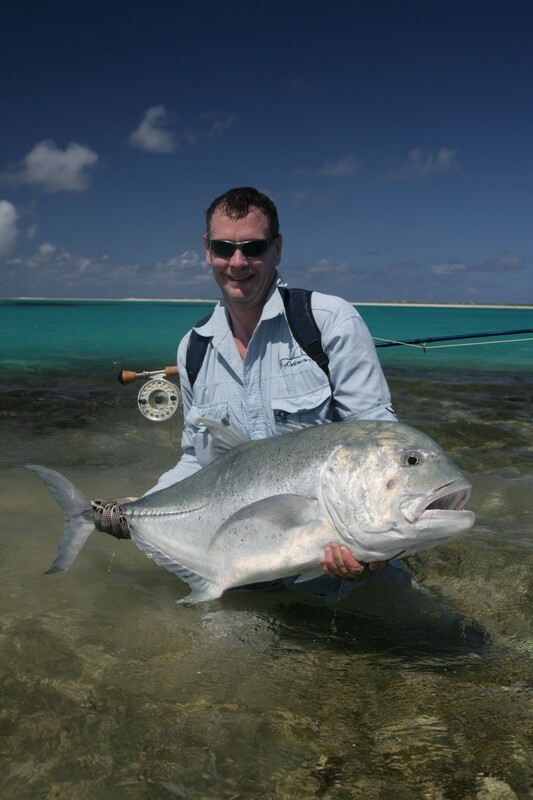 Selectafly boss and champion fly fisher Martin Webster with an impressive Seychelles GT. Martin just can’t get enough of the brutal take of these ‘gangsters of the flats’. Like everyone else I go fishing to catch fish and have a good time along the way. And much as I will be pleased as punch whenever the scales register another roach over two pounds or the camera shutter clicks as a big tench, bass or barbel slides back into the deeps, it is the next bite I’m after. For me it really is all about that take. Is it the same for you? The thrill is, and will ever be, the point of contact! I can’t understand why you’d go all the way to Aussie and NZ for trout. Didn’t you know that all of them in the first place came from Bishopstoke on the Itchen where I live. See the whole story — including my starring role — on BBC south Today next Thursday at 6.30. Fame at last — and that’s not including my latest book A Multitude of Fins. Enough shameless plugging — off to the Itchen where Skues fished.